Smart phones really broke ground with their weird financing/service contract scheme. The typical cell phone bill is structured to help pay for the hardware, an expensive little portable computer. 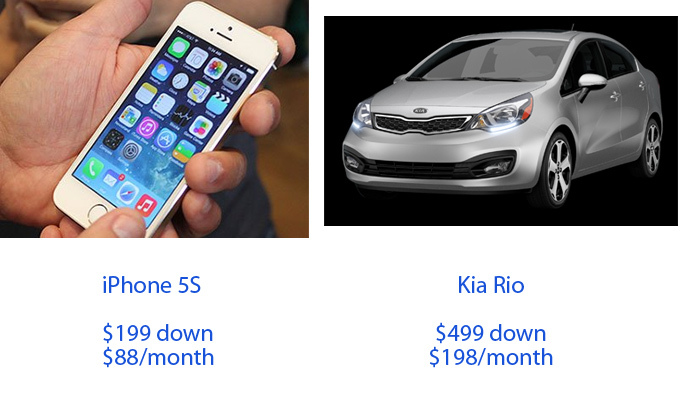 The other day I was confronted with the disparity between my cell bill and the cost of leasing a car. My phone bill, from AT&T was a family plan for both Stacy and I. It was $129. Not two hours later, I was watching a basketball game and the ad below came on. $129?! According to this commercial, I could get a CAR for the same price as the goddamn phone bill! What the hell? This demanded more research. The iphone price was easy to find, but to get car information, I had to visit a dealership. The AT&T family plan gave me two phone lines for one price, but for one person, $88/month is a good average. I assumed that the very cheapest new car would be less than the advertised Kia Optima, but I was incorrect. I talked with Rodney at Folsom Lake Kia. 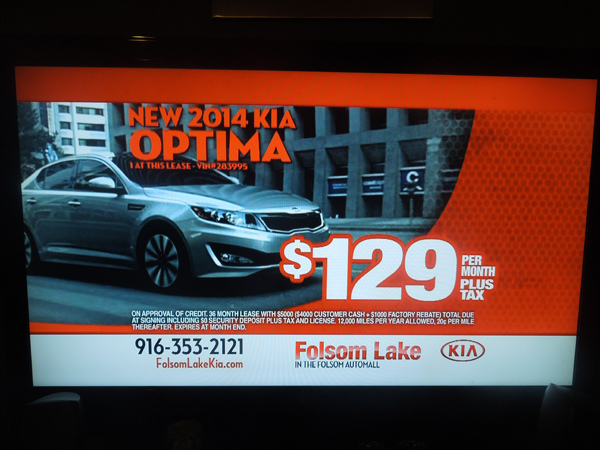 The tv ad Optima was a "one at this price" special, so it didn't represent a typical car lease. It also required a huge $4,000 down payment. A more typical car lease, for the subcompact Kia Rio, would require $499 down, and be $198/month. At this price, the car seems like a much better deal than the phone. It just seems so much more valuable! The extra costs of a car mitigate the super value. Insurance is required and will add about $58 per month to the price of the car, but only $7 per month for the price of the phone. In addition, gasoline will add about $84 per month for the car, whereas electricity for the phone will only add about 7¢ per month. Smart phones aren't cheap. The true price is hidden within the monthly service fee. A car lease can actually seem cheaper at first glance, but a focused examination revealed that the smart phones are cheaper than any new car. But not that much cheaper.